It sounds so simple: Take a clean, free and endlessly renewable resource — the sun — and use it to power your homes and businesses. Yet even as the Gulf oil disaster offers yet another reminder of the drawbacks of fossil fuels, solar power remains on the fringes of the energy industry, especially here in the United States. Solar power accounts for less than 1 percent of U.S. energy usage, according to the Solar Energy Industries Association, a trade group. And although many industry watchers see big potential, the giant U.S. market currently ranks fourth in solar electric capacity — behind Germany, Italy and Japan. While the U.S. has spent decades developing competitive solar technology, efforts to translate that research into the marketplace have faltered because of a lack of national strategy, experts say. “We haven’t developed a conscious plan, a conscious idea about how we might shift from our current set of resources, like coal and oil, to something with a better environmental and self-sufficiency footprint,” said Ken Zweibel, director of The GW Solar Institute at George Washington University. To Zweibel, the fact that even something as disastrous as the Gulf oil spill has not prompted a major drive toward less-polluting energy sources is just more evidence of that lack of commitment. "I don't think we understand what we're getting, and I think what we're getting is energy independence, which is price stability," he said, referring to solar power. Despite these barriers, experts say it would be foolish to ignore the U.S. market, which is attractive both for its sheer size and for its vast, open sunny spaces in states such as Arizona and California. "The U.S. is considered to be a huge market with still a lot of untapped potential," said Tim Hanley, a vice chairman at professional services firm Deloitte & Touche who specializes in industrial products. Proponents point to growing federal support for solar development, including incentives included in the $787 billion stimulus bill Congress passed in response to the Great Recession. Monique Hanis, a spokeswoman for the Solar Energies Industry Association, said a 30 percent manufacturing tax credit alone has resulted in 58 new plants being built to produce solar energy equipment. Some states and cities also have set renewable energy targets, and the industry expects that will prompt more growth in the coming decade. “We’re way behind in the U.S., but it’s starting to change,” said Alan Bernheimer, a spokesman for First Solar, a Tempe, Ariz.-based solar technology company. Still, as companies in countries such as China and Japan move aggressively to develop and deploy solar technology, some experts say the U.S. is losing the competitive edge it built over years of solar innovation. That could mean this country will not realize the full benefit of sun-based power, in terms of both jobs and profits. “There are demand effects in these things, and large local markets do matter,” said Gary Pisano, a professor of business administration at Harvard Business School. Pisano agrees that the nation's solar technology industry is faltering because of a lack of commitment, from university research labs to manufacturing facilities. Business leaders including Microsoft co-founder Bill Gates, General Electric Chief Executive Jeff Immelt have similar concerns about the U.S. role in new energy research. Last week Gates, Immelt and others including Bank of America Chairman Chad Holliday and Xerox Chief Executive Ursula Burns called on the U.S. to greatly increase funding for cleaner, more efficient energy technology and develop a national plan to deploy it. Immelt warned that if the U.S. doesn’t take an aggressive leadership role in energy now, others will. “The world is not going to wait for the U.S. to lead,” he said. The United States does have plenty of solar technology companies, including First Solar, one of the largest providers of photovoltaic technology. Still, many of First Solar’s customers are in Europe, and much of its production is in Malaysia, although it also has plants in Ohio and Germany. 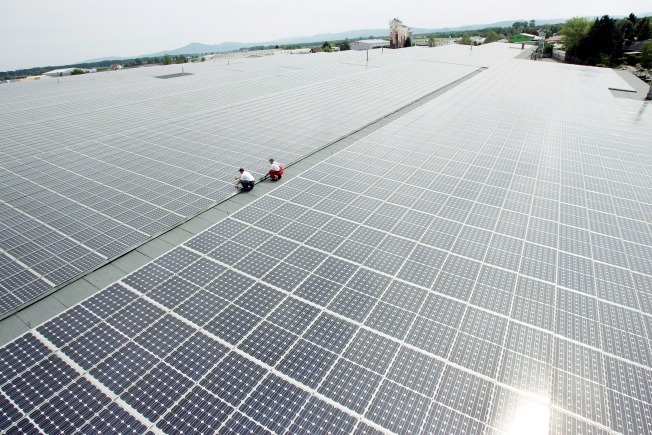 Many of the industry’s well-known players including Suntech and Sharp Solar are based in Asia, which is also where much of the solar equipment manufacturing is done. Zweibel said he thinks solar manufacturing capacity in the United States is about equivalent to demand here. To establish a larger manufacturing presence, the U.S. would need to make a bigger commitment. “We don’t have it (now) because we don’t have the market," Zweibel said. Even if the United States fails to become a leader in production of solar technology, we still could become a bigger consumer, Harvard’s Pisano said. “The U.S. is very good at buying stuff," Pisano said. The cost of producing solar energy has dropped substantially and is expected to keep falling — a crucial development because energy traditionally has been relatively cheap in the United States. Bernheimer, of First Solar, said his company is hoping to get closer to “grid parity” by 2014, meaning that solar power would cost about the same as current energy sources such as natural gas. One problem is that there are substantial upfront costs to switching to solar energy, whether at home or in a large-scale system. That's one reason solar proponents are pushing for more government incentives. While some technology for storing solar exists, experts say there are not yet enough affordable ways of extending solar power usage when the sun isn’t shining. Without storage options, solar energy users have to depend on the regular power grid at night or on very cloudy days. Branko Terzic, regulatory policy leader in energy and resources with consulting firm Deloitte, said the U.S. also needs to deal with regulatory issues that are keeping people from deploying solar technology. These include homeowner associations that frown on solar panels for aesthetic reasons, fire and building codes that are hard to apply to solar technology and electric utilities that are unprepared for customers to supply some of their own power. Terzic is perhaps most optimistic about the development of smaller-scale solar technology that homeowners or businesses could install on their roofs or perhaps even apply in the form of siding, paint or windowpanes. But for such small-scale systems to become mainstream they will have to become far more user-friendly, he said. That means creating products that consumers can buy at a big-box retailer, install on their own and easily connect with their regular utility provider. Companies that sell these systems also will need to convince the public they are worth the investment. “No. 1, we have to have competitive technology. No. 2, we’ve got to get the marketing and word out there. And No. 3, we need to remove any barriers there are to using solar in the form of regulation,” Terzic said.